The strengthening labor market and a new willingness by companies to transition workers to permanent roles caused the total number of independent workers to decline by 5% this year, according to MBO Partners 2016 State of Independence report. The annual study estimated that 39.8 million people worked independently in 2016, compared with 42.1 million the year before. That represented the first annual decline in the number of independents since 2011, when MBO started its survey series. Despite the reversal, a large majority of the workers surveyed said they intend to remain independent, citing reasons such as increased earning power, control over their careers and greater flexibility. The numbers reflect cyclical economic forces rather than a retreat from independent work, MBO said, and contingent workforce practitioners have much to gain in understanding the motivations and characteristics of this overall growing population. Known by several names — independent workforce, contingent workforce, gig workers, freelancers — this cohort of workers has become the subject of increasing interest, as governments and companies attempt to make sense of the apparent increase in people working outside of full-time work arrangements. The MBO studies frame this population of workers under the term and concept of “independent workers,” which it defines by its own unique parameters (for example, workers included in the survey are over 21 years old). Each study time-frame is the 12 months prior to the surveying. MBO breaks independent workers into three main categories: Full Time (consistently work over 15 hours/week), Part Time (consistently work between 1 and 15 hours/week) and Occasional (work sporadically). Below are the estimate breakdowns for 2016 and 2015. While the report covers much more on demographics and behavior (e.g., motivation, choice, etc. 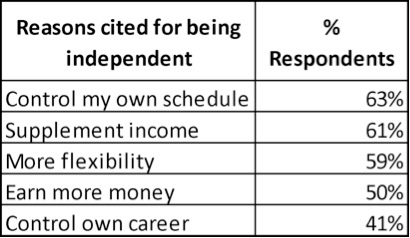 ), perhaps the most interesting element is the top five reasons why independents choose to be independent. All five reasons revolve around increasing control, flexibility and income. This is perhaps not surprising. But it does raise the question of what motivates those that do not self-report in these categories. While the Full Time independent workforce did drop 5%, to 16.9 million, in 2016, the overall increase since 2011 illustrates a larger trend. The first MBO report counted 15.9 million in this segment, and that number rose each year to reach 17.7 million in 2015. Full Time Independents who offer skilled and professional services to businesses are categorized as Independent Service Professionals. This segment accounts for about 40% of the total population of Full-Time Independents, or 6.7 million workers. The average tenure for those working more than 35 hours is 10.5 years. That is more than double the average tenure of 4.6 years for traditional employees, according to the Bureau of Labor Statistics. In 2016, 17.9% of the Full-time Independents — 3 million — earned more than $100,000, up nearly 50% from 2 million in 2011. More than 4.7 million Full-Time Independents — 28% — earned more than $75,000. In the contingent workforce procurement area, there has been much discussion in recent years about a potentially increasing population of freelancers and independent contractors subject to direct-sourcing methods. These data may support that proposition. How large and significant that workforce may become for large organizations remains to be seen. But despite this year's slip and legal/regulatory headwinds, the trend does seem to be upward.